Ready for some great backpacking food ideas? Before you discover the food to take backpacking, just a word of warning. You also need to know how to calculate exactly how much food (calories and nutrients) you'll need. This was written just for you! And why hiking nutrition is so very important to your success as a backpacker. The backpacking food ideas you're about to explore were picked with all of these factors in mind. So let's go through a typical day of hiking food you would consume on a backpacking trip. Note: Hiking For Her is an Amazon affiliate. When you purchase your backpacking food here, HFH receives a small percentage of your purchase price. You pay nothing extra for these great backpacking food ideas. 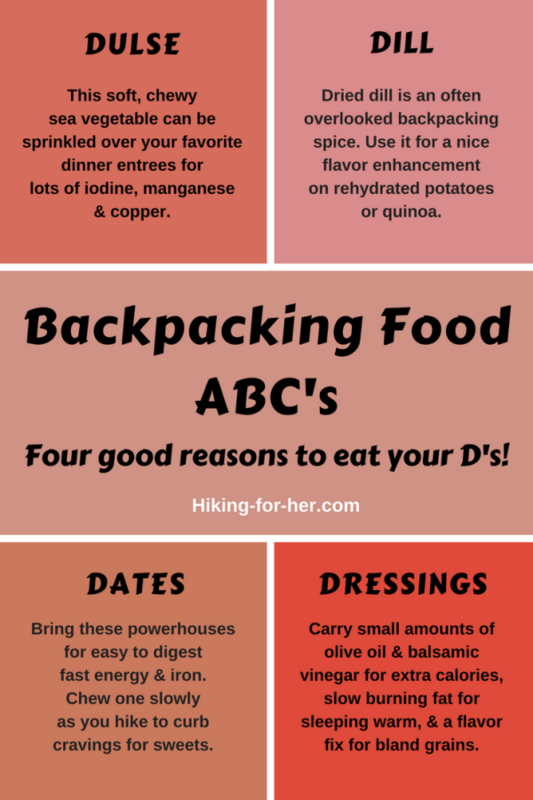 The goal is to help you with the question of which food to bring backpacking! When I shed my sleeping bag in the morning, I'm in a "let's get on the trail" frame of mind, so speed is of the essence. I also throw a handful of unsalted dried fruit & nuts into the oatmeal, which ups the nutritional value and keeps my taste buds from grumbling about bland old oatmeal. Note that this combination balances the three major fuel sources a backpacker needs: carbohydrates, fats, and proteins. My favorite instant oatmeal: McCanns Irish oatmeal, maple and brown sugar variety. You can drip a bit of oil (EVOO) into it to up the fuel quotient in cooler weather. I like the convenience and portion control of individual packets. And the glucose in the brown sugar will be put to good use on the trail. You can also choose plain oatmeal, and add some hacks (see below). You can allow your oats to soak overnight in a water bottle or covered pot, eliminating the time and energy to fire up the stove to rehydrate them. This route to a hearty backpacking breakfast isn't recommended in cold spring or fall weather, because it robs your body and mind of the welcoming warmth of piping hot oatmeal. Instant oatmeal from the bulk bin at my local food store. It doesn't come near to the creamy goodness of McCanns, but sometimes that's all that's available on short notice or when I'm traveling for a backpacking trip. Go to your nearest grocery store or outlet and spend fifteen minutes making a list of the bulk foods you can use for cheap backpacking meals. Then sit down and plan your creative backpacking menu, knowing that you're going as low cost as possible. Although this is the cheapest meal preparation for a backpacking trip, it may not be the best backpacking food if you're searching for healthy choices (preservative free or lower salt) or high quality specialty (gluten free, paleo) sources of hiking nutrition. Bonus points for adding a tablespoon of chopped walnuts, ground flax seeds, or chia seeds! Sometimes the little details in backpacking food ideas make a huge difference in taste and nutrition. If you're going to add flax, go for the golden flakes! Gluten free and high in fiber, but remember to drink extra water to take advantage of the scraping action inside your digestive system. Chia seeds are amazing powerhouses of nutrients, and weigh almost nothing. I highly recommend these as an addition to your micronutrient supply. Tip: Chew slowly to grind down these seeds so the nutrients are released and can help you on the trail. Another way to get a great backpacking breakfast into your body fast is to add a few spoonfuls of an antioxidant mix to your oats. It's lightweight and you'll love how it improves the flavor profile of good old oatmeal. Barlean's antioxidant blend mixes flax, coconut, acerola, acai and camu camu for high fiber and lots of omega-3 and vitamins. Oatmeal is a tried and true trail food for backpackers. But let's be more creative, given the constraints of dawn's early light. First thing in the morning, you want to eat and hit the trail. So which grains can be rehydrated quickly, and taste good? Quinoa takes very little time or water to rehydrate, but delivers a protein punch to a backpacker's breakfast. You can jazz up quinoa's mild flavor with dried fruit or any of the suggestions above. It can be the foundation of a backpacking dinner, too. Or why not try a quinoa blend, like this tri-color one? Takes longer than oatmeal and quinoa to rehydrate. Texture may be a bit gloppy compared to those grains, but you can flavor hack it and then gobble it up. When it's time to find a great sit-spot around mid-day, I'm famished. But backpacking lunches need to be consumed quickly and with a minimum of preparation. So I pull out the sandwich I made that morning, and munch away while enjoying the view. That's only for the first few days, however. Bread is not on the list of food to bring hiking. Although this dense (and tasty) version can hold up pretty well if you keep it dry. When there is no bread available, it's time to break out tasty crackers and nut butters. Be sure to guard the crackers from inadvertent "smush" events (like sitting on your backpack). Crackers packed like this is a good way to keep them from crumbling, although the extra packaging takes up space (but no weight) in your backpack. Another approach is to use crackers like a spoon to transfer your nut butter into your mouth. Choose sturdy ones, like these! And if you're going to be relying on some that pack a big nutritional punch like these seed studded crackers? I've also unearthed lightweight tins of easy-open sardines or herring in nutrient dense olive oil from the bowels of my backpack to supplement my crackers. In fact, paired with crackers, these little salty fishes are quite tasty and highly satisfying due to the oil! Be sure you have a spork to capture every last drop. Just be careful to keep any fishy oil away from your clothing or pack in bear country. And about that spork... I tend to lose them, so I buy a 4-pack at the beginning of every hiking season. Green for spring, blue for early summer, red for the hot months, and orange for autumn! I follow these carbs + protein lunch choices with some tasty cookies (think nut butters or nuts plus oatmeal), a chunk of dark chocolate with almonds, or a Hiking For Her energy sphere (free pdf). I realize that some hikers prefer chunks of cheese/salami with crackers. Jerky + big handfuls of trail mix (nuts, dried fruit, chocolate) and granola bars are also classic backpacking food ideas for lunch. I used to do this in my long-ago 20's and 30's, but found that processed, heavy foods do not agree with my digestion. So now I keep it light and carb rich, knowing that I've got some tasty backpacking snacks for later. I've also backpacked with people who munch only nuts or dried fruit for lunch, and they seem to do just fine. But that's a bit too light for me! Play around with your food on day hikes to see which type of backpacking lunches, day after day, will work best for your digestion. And be prepared to change things up as you age. Ah! First the boots come off, then the stove gets cranked up to boil water. This hot water is used to rehydrate some soup as a backpacking appetizer, which I sip slowly as more water boils. 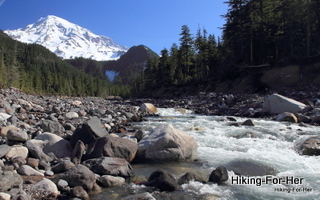 Boiling water is also one strategy for backpacking water purification. Your stove can accomplish double duty while you are setting up camp for the night. This salty soup takes the edge off my ravenous hunger, rehydrates me, and adds back some of the salt I lost during my hike. Just a little backpacking food idea was passed along by my Girl Scout leaders 5 decades ago! After much experimentation, I mostly use the Backpacker's Pantry line of prepared backpacking meals. Because they are lean on artificial additives but high on flavor and nutrients (some even have vitamins and minerals added). Go to this company for great backpacking food ideas - lots of breakfast and dinner entrees, vegetables, and desserts for you to scope out. I think they're a reliable backpacking food option at the end of a long trail day. Are they the cheapest freeze dried food on the market? No, but they're a top brand for healthy and satisfying backpacking food. I started backpacking way back in the 1970s, when Mountain House freeze dried food was just about the only option for a hungry hiker. Recently, I revisited their product line and was pleasantly surprised by its taste and variety. Read my Mountain House review here. If you're looking for cheap and filling backpacking meals which you can buy in bulk, Mountain House should be at the top of your list. Antioxidants can be hard to come by after a few days on the trail. Usually you get these plant-derived protective molecules (a.k.a. "phytonutrients") in salads, cranberries, apples, red wine. On the trail, turn to peanuts and dark chocolate as backpacking snacks to keep your cells protected from damaging free radicals (highly energetic little guys, looking to cause trouble on a molecular level). Try something a little wacky! Rice has been a tried and true foundation for many a tasty backpacking meal, for good reasons. But a smart hiker chooses the right type of rice, which is explained in detail here. Protein is used to repair and rebuild your muscles, and that's important for your stamina and strength. Carrying fresh protein can be heavy, if you focus on animal protein sources. However, dried beans and nuts, along with other lightweight dehydrated and freeze dried animal proteins, can be worked into your backpacking menus with ease. Not sure which protein sources for hikers are best for you? If you are concerned about pesticide residue in your backpacking meals, turn to organic food options for healthy backpacking. I happen to have some information on organic backpacking food to help you size up your options. You want to eat enough food to keep up your core temperature throughout the night and to replace the water you sweated/peed out during the day. Don't skimp on calories when you're backpacking. Consider it richly deserved fuel! You might have to erase or block all of the marketing messages about thinness while you're on the trail. Eat up! While you are in "rest and digest" mode, dominated by the parasympathetic nervous system, the nutrients from dinner are being used to rebuild glycogen reserves for the next day's hike. Also, your body is repairing damage to muscles, tendons, and bones from lugging your pack up the trail. No inflammation for you! As an additional benefit, you won't wake up at 2AM with hunger pangs if you take the time to prepare and ingest a hot dinner. And cold nights won't bother you, because your internal furnace is well stoked. Sea vegetables are packed with important salts and trace minerals that your body needs after a long day on the trail. There are plenty of ways to enjoy seaweed snacks on your hiking trip, including my favorites. One more inexpensive thing you can do to keep yourself healthy on the trail: brew up a cup of tea right before bedtime. 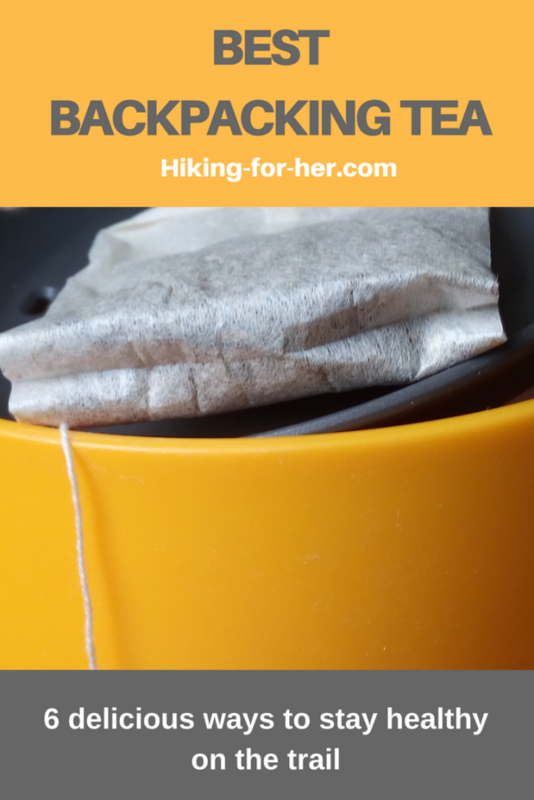 Click on the photo to discover six reasons why backpacking mugs of tea should be on your hiking menu. After you sip your soup, munch your dinner, and relax with a mug of tea, it's time for that final delicious treat of the day: your favorite backpacking desserts. A fast way to get something sweet into your mouth is to make your backpacking snacks do double duty (suggestions below). However, with a little planning and some extra water, you can enjoy something more substantial and filling. Another satisfying way to conclude your day is to slowly chew some dried fruit that you don't normally enjoy at home. For me, that's dried cherries, either unsweetened or covered in dark chocolate with their friends, blueberries and raspberries. Pull these out of the food sack and watch your trail buddy's eyes light up! Try your backpacking meals at home before you hit the trail. Don't risk bringing food that you don't like and can't make yourself choke down, because you're risking your strength and stamina. Trust me (an old trail dog) on how fast you begin to feel depleted when you skip meals. And that erodes your safety margins when you can't make clear headed decisions about navigation or trail hazards. When you're burning daylight making some mileage and don't want to stop to eat, what types of backpacking foods can you eat as you hike? You want something that's not too dry to choke down, and of course you want to avoid choking hazards. Nutrient density should be high, along with fast digestibility. And then there's taste. You want a delicious backpacking snack! Here are a few of my favorite trail snacks that ride along easily in your backpack's shoulder strap zippered pocket or a pants pocket. How you think about backpacking food needs to change when you're on the trail day after day. I go into a multi-day backpacking trip realizing that I will come out the other end with intense cravings for fresh salads, juicy bowls of fruit, and hot home cooked meals. I chalk up those cravings as the price of admission to the back country, a price I am more than willing to pay every time I go on a hiking trip. Plus, it feels so good to finally eat whatever I'm craving! In a perverse way, I almost look forward to the deprivation. I carry dehydrated and freeze dried foods mentioned above for breakfast and dinner with plentiful portions, and take time to prepare them. Then I make up time with lunches built around tasty, uncrushable trail foods high in carbohydrates with protein and fat playing supportive roles. In addition, I pack a multivitamin and other nutritional supplements, "just in case". So just know that predicting ahead of time what your mind and body might be screaming for after a few days on the trail is a wise move! Factor your mind set into your choice of backpacking food ideas, because planning your backpacking menu based on your favorite flavors might will save your sanity. Bottom line for the best backpacking food ideas for your next trip? Fall back on the mantra of the 3 major classes of fuel biomolecules: carbohydrates, proteins, fats. 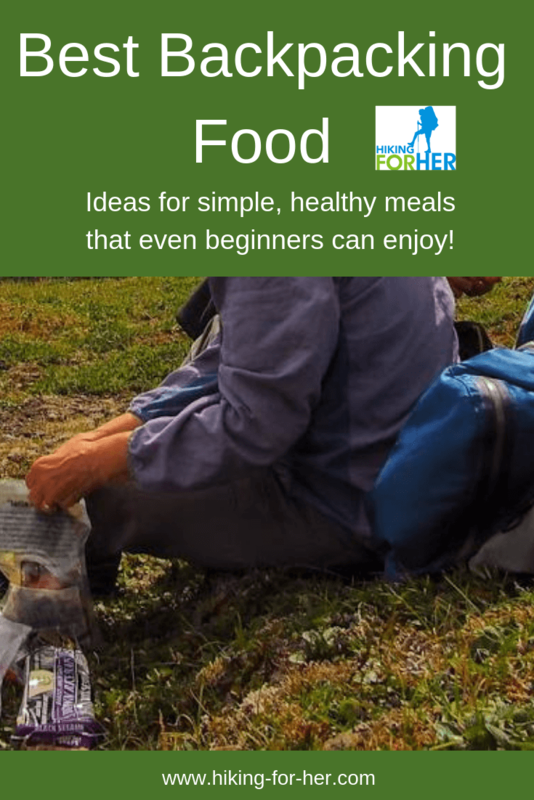 Then build a creative backpacking meal plan around the choices I shared with you. Here's an idea to try on your first (or next) backpacking trip to gauge how you are doing, nutrient wise: keep a daily food log in your trail journal. Note which backpacking meals or hiking foods were especially satisfying, which brands or flavors you loved, and any weird cravings you had. This takes only a few seconds, but yields valuable insight when you look back over it months later as you prepare for another trip. If you're prone to drama, you can also doodle the names of the things you hated, and embellish them with exclamation marks (or worse), just for fun. If you want feedback from body parts beyond your taste buds, be sure to compare pre-trip body weight with post-trip weight, plus keep track of your daily energy levels. This info builds a complete picture of how your "fuel burning plan" (a.k.a. "backpacking food list") worked out. Wow! What a great way to justify lots of backpacking adventures! If you like to be a creative backpacker and devote precious outdoor time to cooking & cleaning up (see my bias? ), there are tons of great recipes for backpacking meals, from talented outdoor chefs. Whipping up backpacking meals is an art, and Chef Glenn is a master of tasty trail food and fancy flourishes. Not sure about backpacking chefs? choose your own eating adventures. I have embraced the reality that I'm probably in the minority: a cooking minimalist. I humbly accept my outcast status, because to me, the entire point of going into the back country IS to explore the back country! But a hiker's gotta eat, right? I always trust the wisdom of my body when I get home from a backpacking trip, especially if I'm a few pounds lighter. If I crave pickles on toast with a side of bacon, that's what I eat until the craving disappears! It's just my little "thank you" to the muscles and bones which got me up and down the trails, and back home safely. So you have my permission to honor your cravings. They might be little postcards from your digestive system to your brain, saying "Pick up a jar of pickles and three pounds of bacon on your way home, honey." Lots more hiking food selection tips here! And if you're a bit puzzled over the difference between dehydrated backpacking food ideas and freeze dried backpacking meals, read this.